Maquoketa Iowa Oct. 26, 1965. 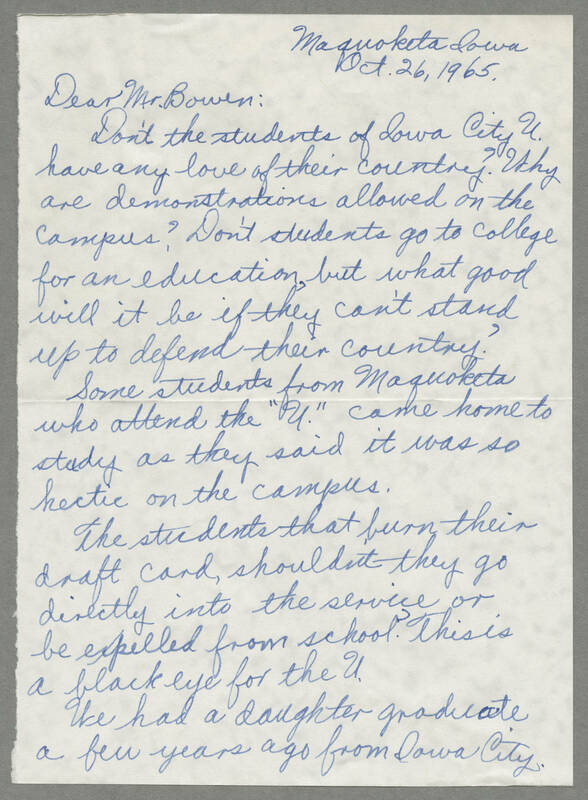 Dear Mr. Bowen: Don't the students of Iowa City U. have any love of their country? Why are demonstrations allowed on the campus? Don't students go to college for an education, but what good will it be if they can't stand up to defend their country? Some students from Maquoketa who attend the "U." came home to study as they said it was so hectic on the campus. The students that burn their draft card, shouldn't they go directly into the service or be expelled from school? This is a black eye for the U. We had a daughter graduate a few years ago from Iowa City.